Looking to build a high-converting landing page in WordPress? Want to know which is the best WordPress landing page plugin? Choosing the right landing page plugin is crucial because better design means more conversions and sales. In this article, we’ll review 6 of the best WordPress landing page plugins to help you find a perfect landing page plugin. What to Look in a WordPress Landing Page Plugin? The main purpose of creating a landing page is to maximize conversions, so you need to be extra careful when choosing a landing page plugin. A good landing page plugin should provide you with the ability to structure your landing page in an attractive way so users come to your site and complete an action you want them to do. You should check if the plugin provides you with all the content elements you’ll need to create a landing page. Landing pages are usually meant for collecting leads or selling products so they contain lots of call to action elements such as buttons, links, forms, etc. In addition, proper headings, images, content blocks, etc. are necessary for building an effective landing page. If you want to learn more, here’s our complete guide on how to structure an effective landing page that converts. Some of the landing page plugins also come with pre-designed landing page templates you can use with little customization. Since they’re designed by experts, they can help you create attractive landing pages quickly. In addition to features, you’ll need to make sure that the plugin is easy to use. If you choose a complicated plugin, you’ll need to invest lots of time learning the plugin or pay a developer for building a landing page for you. Beaver Builder is the best WordPress landing page plugin available on the market. It comes with a simple drag and drop page builder that allows you to easily build a beautiful landing page, without touching any code. There’re dozens of gorgeous page templates to help you kick-start designing a landing page. From the available templates, you can choose one, replace the images and text with yours, and publish. It’s simple with the frontend inline editor that lets you edit all the elements with real-time live previews. You can also save your custom-created pages as templates and reuse them across your site. And, you can export them to other WordPress sites. The plugin is compatible with any WordPress theme on the market. Beaver Builder is a premium plugin that comes with 3 pricing plans. The basic plan is called Standard which costs $99 and the highest plan, Agency, costs $399. Get started with Beaver Builder today! Leadpages is a powerful landing page and lead generation plugin for WordPress. It helps you to create high-converting landing pages and lead generation campaigns in no time, easily, without any code. It has a simple and user-friendly drag and drop interface for building and customizing landing pages. The plugin comes with 150+ professional landing page designs suitable for different industries. Using the templates, you can build lead pages, squeeze pages, popups, splash pages, thank you pages, etc. which help to convert most of your site visitors into customers or leads. If you have to edit the templates, it’s easy with the simple drag and drop front end builder. Moreover, it features seamless integration with popular marketing apps including Facebook, Zapier, Stripe, Drip, MailChimp, etc. You can easily build Facebook ads with its unique ad builder and connect with a large audience instantly. It also provides basic optin forms to capture leads; however, it isn’t great as OptinMonster. The Leadpages plugin pricing starts from $25 per month. The basic plan is called Standard and is suitable for new businesses. Get started with Leadpages today! The Divi Builder is a powerful WordPress page builder plugin by Elegant Themes. The plugin works as the core of their most popular theme, Divi, as well as other themes made by them. However, it can also be used with any other WordPress themes on the market. The plugin features a real-time visual editor that allows you to edit anything on your page directly by clicking on it from the front end without having to open any settings panels. Using the simple editor, you can customize everything including fonts, colors, sizing, spacing etc. There’re 46 well-designed content elements that you can mix, match and create landing pages like you want. The Divi Builder comes with over 20 pre-made layouts which you can use to jump-start your new projects. You can pick one of them and instantly customize it and hit publish. You can also save your custom-made layouts as templates and use them across your site. To get access to the plugin, you’ll need to sign up for one of their membership plans. The Yearly Access plan costs $89 per year and provides you with access to all of their themes and plugins. Get started with The Divi Builder today! Elementor is a user-friendly drag and drop page builder plugin for WordPress. It comes with a simple live editing interface from where you can easily create landing pages by dragging and dropping the handy widgets. There’re dozens of well-crafted widgets in the plugin that you can use alongside other widgets available in your theme and additonal plugins. With Elementor, you’ll get 300 beautifully-designed templates suitable for landing pages of any niche. You can choose a template, quickly replace the demo content with your original content and publish it. Furthermore, you can save your designs as templates and use them across your sites by exporting it. The plugin comes with a full set of eCommerce widgets to allow you to create a shop and sell products. Plus, you can find options to create forms and plenty of other features that let you handle your design with ease. Elementor pricing features 3 plans of which the basic plan, Personal, costs $49 and you can use for 1 site. You’ll need to purchase the Unlimited plan to use it on unlimited sites. Get started with Elementor today! OptimizePress is yet another powerful WordPress plugin you can use to create conversion-optimized landing pages and sales pages. It comes with a bundle of exciting features including easy optin forms, email marketing integration, and pre-made layouts to help you create effective landing pages. There’re 60 beautiful templates included in the plugin and you can find over 300 templates in the OptimizePress marketplace. If you like any template from the marketplace, you’ll need to purchase it separately. Moreover, it has over 40 custom elements to add functionality to your page. The elements are highly-flexible so you can fully customize them and create unique designs. The benefit of OptimizePress is that you can build membership sites, blogs, and sales pages without requiring any extra plugins. The OptimizePress pricing starts from $97. The basic plan is called Core which you can use on 3 sites. Get started with OptimizePress today! Coming Soon Pro by SeedProd is a maintenance mode and coming soon page plugin for WordPress. If you have a half-built website and you’re planning for a big launch, this plugin helps you to create a coming soon landing page until your site is ready. This is also useful when you plan to make major customizations on your existing live site. The plugin comes with a real-time page builder that allows you to build a beautiful coming soon page in minutes. You can add a title, images, email form, countdown, social icons, etc. easily and publish it. There’re over 50 coming soon page templates available to help you quick-start your new project. Plus, you can use more than 500,000 free background images, and over 750 Google fonts on your coming soon pages. Io help you collect more leads and boost email marketing, it provides integration with multiple marketing tools. SeedProd Coming Soon plugin has 4 pricing plans of which the basic plan is Personal. You can buy this plan for $29 and use it on 1 WordPress site. Get started with Coming Soon Pro today! So, that was our brief review of the best WordPress landing page plugins. You can pick one of them and build an attractive landing page easily and quickly. After you publish your landing page, you’ll need to monitor how it’s performing. MonsterInsights is the perfect tool for tracking your landing page visitors and their interaction on your site. MonsterInsights is the best Google Analytics plugin for WordPress. It helps you to install Google Analytics in WordPress easily without having to edit your theme file to insert the Analytics tracking code. After it’s set up, it automatically tracks your site’s overview report and provides you with easy-to-understand reports inside your WordPress dashboard. 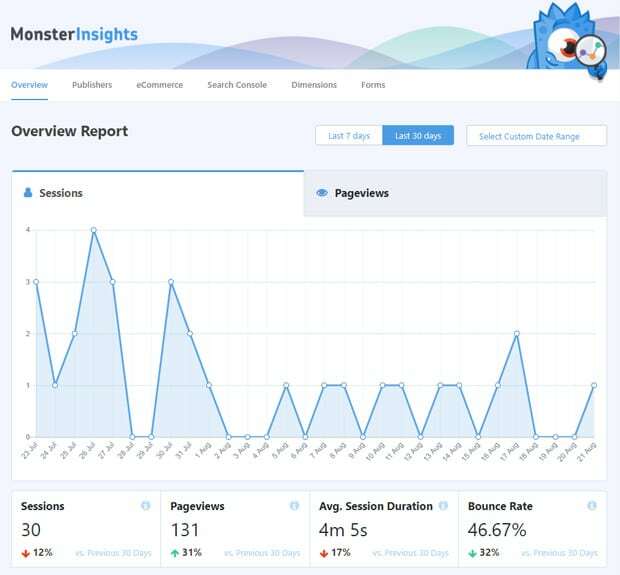 A quick summary of the website analytics report is available in MonsterInsights dashboard widget. To view the full reports, you’ll need to visit Insights » Reports from your dashboard. There, you’ll see the overview report first. In addition, you can track advanced metrics like downloads, eCommerce transactions, custom dimensions, etc. using this plugin. Clearly, MonsterInsights is very useful for a fast-growing landing page. So, if you found it useful, download the plugin today! If you’re still confused, you can check out all of its features before making your purchase. We hope this article helped to find the perfect plugin for building landing pages and taught you how to track your landing page’s performance. You may also want to check out our handpicked list of the best free WordPress plugins for every site.